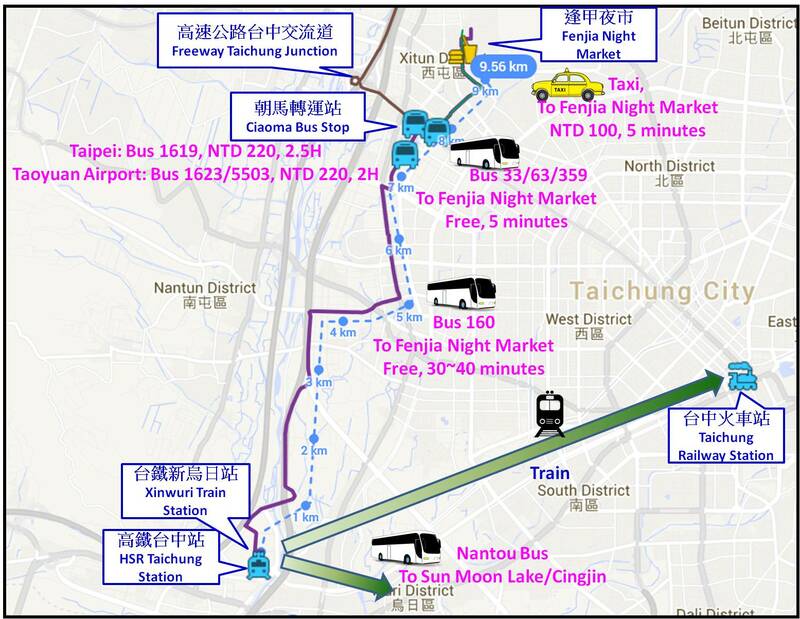 There is always a question from foreign visitors: "How to go to Taichung/Fenjia Night Market from HSR Taichung station". 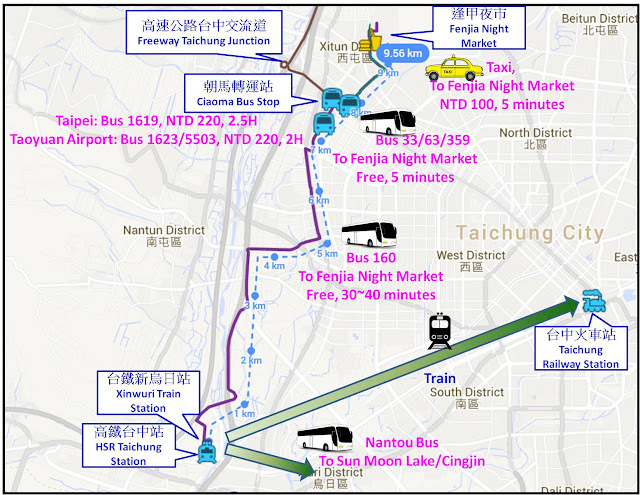 However, the question should be "How to go to Taichung/Fenjia Night Market from HSR Taichung station", which excludes the premise : HSR Taichung Station. That's a trade off : would your save 50 minutes by extra NTD 420 ? Hi, if we are staying near Taichung railway station would taking a bus or HSR be a better choice? We are leaving from taoyuan airport. - How much is the taxi fare from Taichung HSR station to Caotun? - Is Uber available in Taichung/Caotun? - Would there be many people travelling during this time? 11th Feb is the Yuanxiao Festival(Lantern Festival). Do you decide to give up Sky Lantern Festival or other Festival? 11th Feb is a usual weekend. If you don't go to some festivals, not many people there. Hello Sullivan, really thankful to you for providing lots of helpful information to us! I'm planning to travel from Kaohsiung to Taichung on 15 April for 2 nights stay at Taichung. 1) I'm considering to take either HSR or TRA from Kaohsiung to Taichung. I already know the cost and duration via the HSR way, but I could not find any information via the TRA way. May I know what is the correct station names to search on the TRA website? 2) Is it correct that the Taichung TRA station has baggage storage room whereas the HSR station only has lockers? 3) My plan is to deposit my luggage for few hours to take my lunch and shop at YiZhong Street. After that, will go down to Fenjia night market at my hotel is in that area. If my research is correct, I can take free shuttle bus from Taichung HSR to Fenjia if I had taken the HSR? May I know if you have any info on the shuttle bus timings? Otherwise, may I know what other bus can I take to Fenjia? 1. Should I skip the 1night stay in Taichung and head to SML for 1 night instead? 2. If I still decide to stay in Taichung for night, should I stay near Fengjia or the HSR? 2. HSR is in rural area. It is boring and not easy to find a hotel near the HSR station. Lots hotels near FJ and Taichung Station. Hi, I am going to Taichung on November 24, at noon. my interested spots are Xinshe Sea of Flower, Gushen View Restaurant, Gaomei Wetlands. Is it possible to go there in half day? Due to there's no shuttle bus to go to Xinshe Sea of Flower in the weekday . please advise me how to get there. Unless you hire a cab, you can only finish one of them. Can you guide me how can I travel from Hualien to Taichung by train? Also how long is the journey?